I am a Finn, teaching teenagers in London. Oscars are almost here now! A simple matching activity of film and cinema vocabulary, including: set, cast, premiere, soundtrack... Comes with a key. Writing about people and what they are wearing. 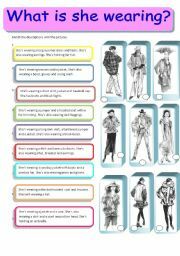 To complement my three previous fashion worksheets: women, children and men�s clothes. Here you have two versions: first one is a gap-filling version and the second one is for more independent writers with a vocabulary box for ideas. Merry (White!) Christmas from wintry London! 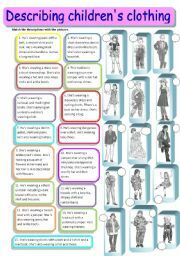 A matching activity to revise describing what people are wearing. This first part is about women�s clothing. Fully editable. Thanks again to Marimaise for the template! 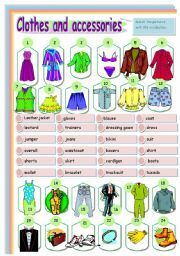 The second part of my matching fashion worksheets includes 15 pictures of children and teenagers� clothes. Fully editable, a teacher�s key included. Thanks to Marimaise for the template! 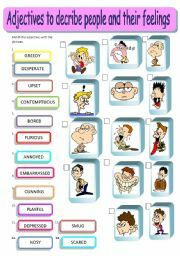 A matching activity with adjectives describing people and their feelings that can be difficult to explain, e.g. cunning, greedy, desperate, embarrassed. Fully editable and key included. Thanks to Marimaise for the template! 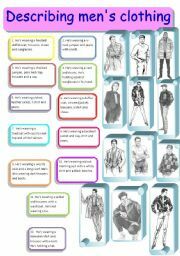 My last matching fashion activity - now it�s men�s turn! 12 pictures to match with descriptions. Fully editable. Thanks to Marimaise again for her template. 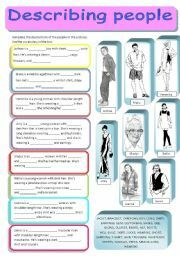 I will next upload a mixed fashion writing activity. 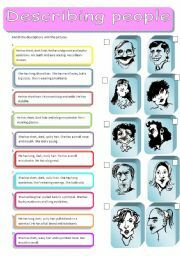 A matching activity with caricatures of people and their descriptions. Fully editable. Thanks to Marimaise for the tamplate that I have slightly modified. 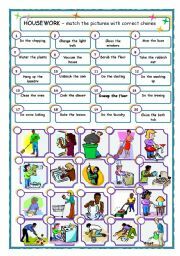 A matching activity with 20 household chores and pictures for elementary/intermediate students. I�d like to thank the member who provided the template! 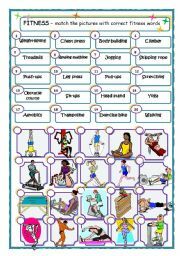 A matching worksheet for fitness nouns and physical exercises including gym machines. 20 pictures for intermediate level. Thanks to the member who�s provided the template! A matching activity including 24 items. Fully editable and the key is included. Thanks to Jecika for the template! Quiz students about the weather with animations. Fully editable. Animations from animationsfactory.com. Template partly by Epit. 20 signs and notices from everyday context, from toilets to train station. Use as flashcards. I have also uploaded my worksheet connected to this. All editable. A lesson after reading some job adverts and looking at how to write a covering letter to apply for a job. Includes a humorous cover letter that can be corrected in groups. Also a traffic light tracking sheet with race car animation to show students� progress within the unit. All editable. This is an easy letter writing task for my beginners using a writing frame to guide them. Our students have penpals in France and hopefully will improve their independent writing skills in the process. Use as a starter or plenary or as a five-minute filler activity. Can also be used for group work if you print out the slides and cut the questions and answers so students can match them in groups.